The vin­tage photo of the day is from the series Por­tu­gal by Mas­ter Czech pho­tog­ra­pher Josef Koudelka and was taken in 1976. 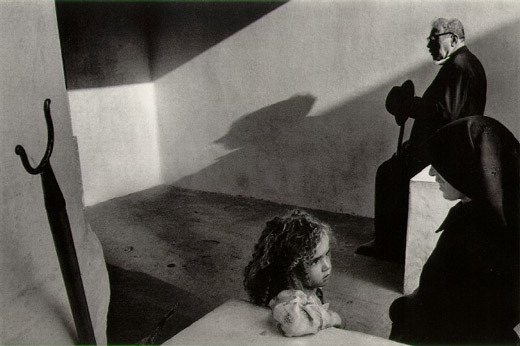 Koudelka is well known for his work pho­tograph­ing Gyp­sies in Slo­va­kia and Roma­nia as well as cap­tur­ing the daily‚interactions‚of peo­ple from many dif­fer­ent (mostly) Euro­pean countries. What attracts us to this image is the sense of story com­bined with bril­liant com­po­si­tion. I don’t know what the story is here but it’s a drama. Older man waits in back­ground with a shad­owed pro­file over­look­ing a pri­vate con­ver­sa­tion. The woman is smil­ing in pro­file, per­haps try­ing to soothe or coax the young girl, and the child is con­cerned. What is hap­pen­ing to her? For me, this scene is filled with tension. Com­po­si­tion­ally, this image is a master-class. Angu­lar lines add to the ten­sion in the image. Tri­an­gles (our eyes love‚triangles) are every­where . Cor­ners, angled light rays, noses, table ends, knee bends, elbows are just a few of the tri­an­gles that we see. Look harder and you’ll see more of them…it’s no acci­dent that they are there. Even the inter­ac­tion (both obvi­ous and sub­tle) between the 3‚individuals‚is tri­an­gu­lar. Some fine black and white print­ing with a rich assort­ment of tones further‚adds to this image’s impact.